CANLUBANG WINS 9TH INTERCLUB TROPHY. 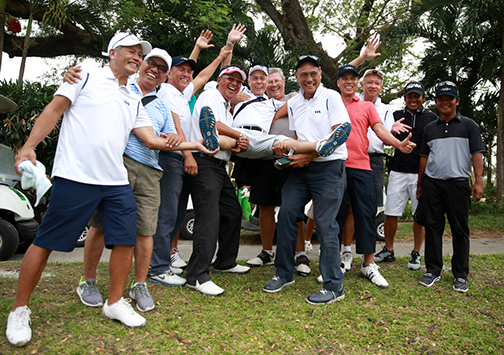 Canlubang manager Luigi Yulo gets the traditional ride from his jubilant team members after winning the 30th PAL Interclub Seniors championship division title on Sunday held at the Mimosa Golf & Country Club in Clark Field, Angeles, Pampanga. The 9th Seniors Interclub trophy of Canlubang was brought home by (from left) Tommy Manotoc, Mari Hechanova, Zaldy Villa, Boyet Zaragosa, Darly Patalot, pro Juvic Pagunsan, Dave Hernandez, Abe Avena, playing captain Tony Olives, Rolly Viray, Rene Unson and manager Luigi Yulo. Cebu Country Club fell short in its mission to pull the rug from under the host team and settled for second place in the Founders Division of the 30th Philippine Airlines (PAL) Seniors Interclub at the Mimosa Golf and Country Club in Angeles City, Pampanga. 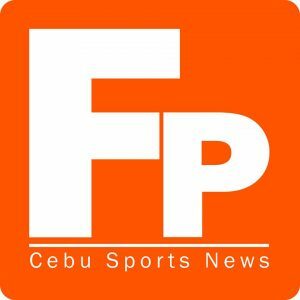 In the premiere Championship Division, Canlubang successfully defended the title it won in Cebu last year by upending Luisita, which held the lead during the first two rounds of the four-day event for players aged 55 years old and above. Cebu Country Club was only eight points behind Mimosa after the third round last Saturday, but failed to match the scores of the hosts on the final round played at the Mountain View course of the 36-hole layout. Mimosa amassed a total of 567 points on rounds of 149, 140, 133, and 145. The final day performers for the team were Lee Dong Koo 50, Park Chanwoo 48, and Rico Santos 47. The 44 of Wolfgang Simandal did not count in this four-to-play, three-to-count event using the Molave Points System. Cebu Country Club managed only 140 points on the final round behind the 50 points of Montito Garcia, 46 of Dr. Lor Alaan, and 44 of Nonoy Tirol. Masatsugu Ochiai had 39, which did not count. The other members of the team are George Hong, Koichi Horii, Kim Kwang Seok, and Efren Srmiento. The Cebuanos had an aggregate of 554 points on rounds of 133, 142, 139, and 140. Third place went to Orchard with a total of 546 points (129, 137, 140,140) followed by Manila Golf with 517 (131, 129, 131, 126). Cebu’s Alta Vista Golf and Country Club finished fifth with a total of 498 points on rounds of 126, 118, 132, and 122. Razi Razon led the team on the final day with 45 points while the club’s golf director Ramon Sebastian added 40, and Emir Abutazil fired 37. The 36 of Wendell Yap did not count for the team total. The other members of the team are skipper Roy Damole, Victor Gocela, Masahisa Kawakami, and Jun Suan. There were 16 teams in this second-ranked category. Canlubang, which seized the lead during the penultimate round last Saturday, went out with guns in full auto to bag the main title at stake in this annual event. This is the club’s ninth title in the seniors’ event. Canlubang had a four-day total of 575 points on rounds of 138, 138, 150, and 149. The final round saw Zaldy Villa leading the team with 51 points while Rolly Viray and Tommy Manotoc each added 49 points. The 47 of Rene Unson did not count. Other members of the team are Abe Avena, Mari Hechanova, Dave Hernandez and Tony Olives. Luisita, which led by as much as 12 points midway through the tournament, mustered a total of 570 points on rounds of 146, 142, 136, and 146. Ex-pro Eddie Bagtas led the team on the final round with even-par 54 points but he did not get enough support from his teammates. Jingy Tuason made 47 points and last to count was Pepot Inigo with 45. Minieng Maravilla made 41, which did not count. Other members of the team are Richie Garcia, Chito Laureta, Eduardo Sison, and Benjie Sumulong. The Interclub is sponsored by People Asia, Travelife, Mareco Broadcasting Network (Crossover), Manila Broadcasting Corporation, Airbus, Business Mirror and Philippine National Bank. Action in the Aviator, Sportswriters, and Friendship divisions were still ongoing as of presstime.